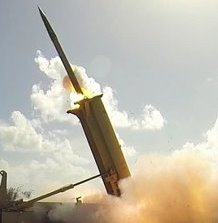 Beijing [China], May 10 (ANI): The Chinese Defense Ministry has announced the successful testing of a new type of missile which analysts say is a response to the deployment of the US-built Terminal High Altitude Area Defence (THAAD) anti-missile system in South Korea. "The People's Liberation Army Rocket Force conducted tests of new types of missiles somewhere in Bohai in recent days, and achieved desired results," South China Morning Post quoted that the ministry, as saying in a statement. The statement did not say what missiles were tested or when the launches took place. It said the test was designed to boost the military's capacity to fight threats to national security. Military analysts said the "rare high-profile announcement of the missile tests" was a response to the THAAD deployment. The announcement comes after last month Defence Ministry spokesperson Yang Yujun that Beijing would conduct live-fire drills and test new weapons to safeguard its security in response to the THAAD roll-out. The US military began installing the first components of the system in South Korea late last month after North Korea refused to halt its missile launches and nuclear tests. Zhou Chenming, from the Knowfar Institute for Strategic and Defence Studies, a Chinese think tank, said: "The test might involve variants of new missile types, including the DF-21, DF-26 and other types of Dongfeng series missiles." The DF-26B is the new generation of the Dongfeng series missiles.